St Louis is a big city, spanning from Missouri to Illinois due to its placement across the Mississippi river. The Metro East of St Louis is located in Illinois, and it has been plagued with higher rates of hard drug use recently. This is not the first thing that East St Louis has struggled with. The city has been in trouble for decades, with high crime and neighborhoods on the decline. Apparently the legalization of marijuana in Illinois has made it harder for dealers to make money from it. In response they have turned to dealing harder drugs to keep their cash flow up. 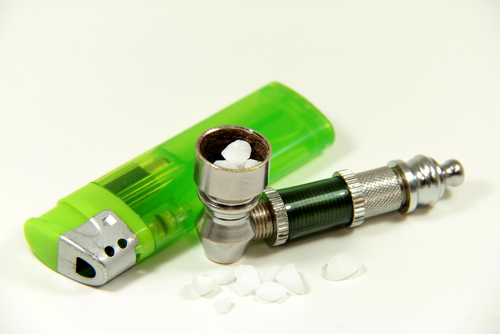 Crack cocaine is cheaper and easier to manufacture than heroin or meth, and is now the most prevalent of the street drugs in the Metro East. There’s a particular place in East St Louis which is referred to locally as “Vulture Alley” because of the extremely high crime rate and the fact that criminals (lots of dealers, lots of prostitutes) always seem to be ready there to take advantage of lesser criminals or bystanders. As of February 2014, an Illinois narcotics team had already spent six months in the area working on busting criminals and clearing them out to make the neighborhood more safe. Based on the arrest reports of this special squad, it’s easier to catch the prostitutes than the dealers. Despite the area being known for its dealers blatantly standing on corners to sell their product, during one day where a journalist was allowed to accompany them, the police only seized 12 ounces of crack cocaine and 4 ounces of powder cocaine. There is the definite possibility that the dealers have simply changed their location since they know the police are focused on Vulture Alley right now. After all, the rise in cocaine supply has to be coming from somewhere. In May of this year, an East St Louis police officer named Orlando Ward was sentenced to five years in federal prison for aiding drug dealers by providing information. He accepted bribes totaling $5,000 to provide information, doing things like looking up license plate numbers. He understood that by doing so, he would be helping drug traffickers move large amounts of cocaine into the city. Around the same time, there was also a judge in the area who was removed from the bench after being found in possession of heroin and an illegal firearm. A broader scan of headlines of the metro east area reveals a troubled zone trying to rise above. There is murder, drug dealing (cocaine, of course), shooting of police officers, handguns and other weaponry at the high school level, carjacking… and that’s just in one criminal investigation of a pair of teenagers living in the Metro East. However, residents haven’t entirely given up. In late January, East St Louis kicked off an event campaigning for 40 days of non-violence in the city. They declare, “If a day can make a difference, what a difference 40 days can make.” This is a community effort supported by local businesses, churches and even sororities. According to a local newspaper, participants will receive training in “the art of communication, conflict resolution, how to dress to impress, role playing and life skills”. Every Saturday, special events will be held for most of the day. It’s a real effort to turn things around especially for kids in the area. Community leaders are cautiously hopeful that this event (the second one annually) can help the city to turn around.